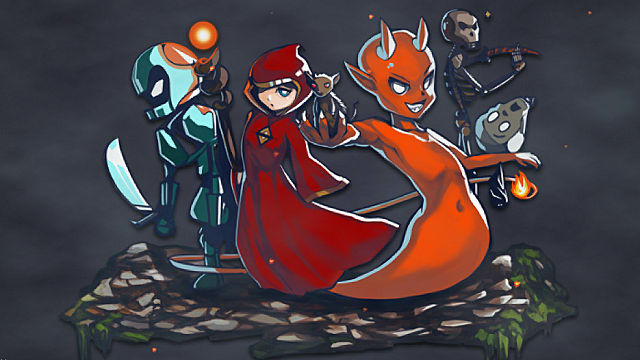 MidBoss is a turn-based roguelike RPG created by Emma 'Eniko' Maassen and developed by Kitsune Games that has a lot of interesting elements that set it apart from other games in the roguelike genre. 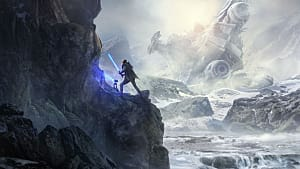 But even though it's a charming game with a great initial concept and plenty to offer, one particular flaw holds it back from being the great game it could be. In MidBoss, you play as an imp, the weakest creature in the dungeon, whose only ability is being able to possess other beings. Tired of being bullied by the other monsters in the dungeon, you journey through the ever-expanding floors of the dungeon. Along the way, you possess different enemies to become stronger and stronger. You'll bring along your talkative fireball sidekick, Mid, who affectionately calls you Boss, as you unlock various abilities and take on multiple forms -- all on your way to becoming the most powerful being in the dungeon. One might assume that to possess an enemy, you have to leave them at the brink of death, with only the tiniest bit of health left, but possession is done a little differently in this MidBoss. To possess an enemy, you must first cast the Possess spell -- preferably before you start fighting them -- and then defeat them in battle in order to take control of them. It's an interesting way to implement a possession concept, but it works well enough. Some enemies may also be more aggressive than others and will be more likely to notice your mischief and attack you if you aren't stealthy enough. 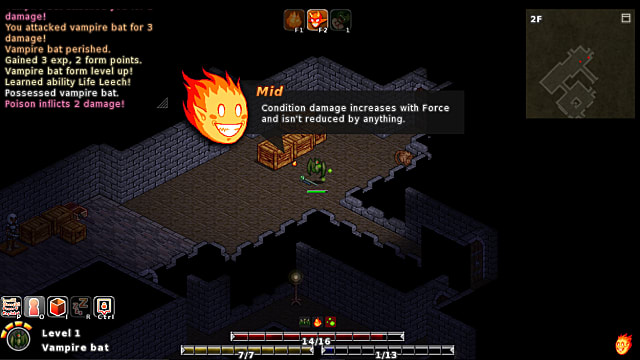 The combat of MidBoss is turn-based and consists of the player repeatedly "bumping into" their opponents using grid-based movements. 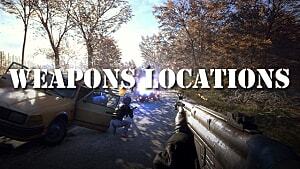 Depending on your form, various weapons can be equipped to deal major damage to enemies. But luckily, the combat itself is well paced and its speed can be altered slightly via the options menu. A battle can be over in the blink of an eye if you're facing an enemy a bit stronger than your current form, so watch out. 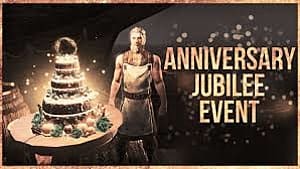 Each form can also use up to three different abilities -- 60 different abilities are available throughout the game and can be either active, passive, or innate -- although you gain more as you level up that form. Different abilities can be selected via the forms menu screen, but as an imp, your only abilities are possession and dispossession, which you keep as you change forms. Using depossess also recovers some health. Abilities also consist of several different damage types: physical, magical, poison, and fire, and the damage each type deals is affected by how high a certain stat is -- such as condition damage like poison or fire being affected by the force stat. Once a form has been "Mastered" it allows access to that form's innate ability, which is always applied when in that specific form, even if the ability itself isn't equipped. However, if the equipped form is optional, the innate ability won't be activated unless it's equipped. All "Mastered" forms also multiply the meta attributes of imp form. This is useful for when you're in a form you may not particularly enjoy and want to take on a previous form you're more accustomed to -- provided that the particular enemy is around of course. Your meta attributes --Violence, Cruelty, Adamancy, and Relentlessness -- define your strength, critical hit ratio, status effect damage, defense, and stamina. These carry over through your various forms and are multiplied by your form's stat multiplier. This creates your core attributes. Points to increase your meta attributes are gained as you level up, and can change your play style depending on which stat(s) you focus on and which enemies you prefer to possess. Like various other roguelikes, MidBoss features plenty of equippable and consumable items. There are six rarities: common, uncommon, rare, epic, legendary, and unique, which include unidentified and cursed items. 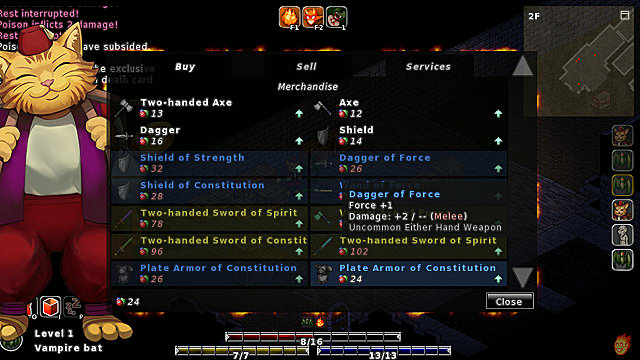 Equippable items include shields, armor, boots, and accessories. Both types of items can be found in treasure piles or chests -- or you may find some of these chests and piles completely empty. 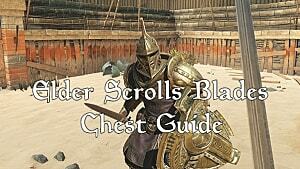 On top of that, a royal chest spawns in a random location on each floor and may contain special loot. Potions are randomized. Cursed items provide great benefits but also have intense risks. For example, the Infernal Slayer's Staff of Spirit, which increases your melee and magic damage, as well as your spirit, also decreases your evasion by 15 points. Not the best item to use early in the game. However, it may be useful once you have gone through a few floors and can possess stronger forms that make the stat multiplier increase more. Weapons and consumables can also be bought from a mysterious Cat Merchant -- no you can't kill or possess him, no matter how much you want to -- by using as currency balls of yarn you find in treasure piles. Other than potions, you can also rest to restore mana just by pressing the dedicated key and staying still while waiting for the gauge to refill. A useful trick that more games should use rather than leaving you low on mana until you can find the right consumable item. When you die, you obtain a customizable death card that summarizes your past run and can be shared on social media. 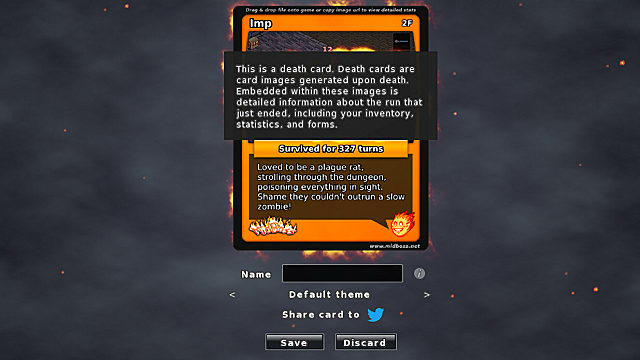 Saving a death card to the gallery will allow you to start with an item from said card -- from that specific run -- in a new game, or it will allow you to try again with the same settings to help you improve your performance. Shared cards can also be uploaded from images of them to be used in your own game. If you beat the game instead of dying, you get a victory card, which has most of the same functions as a death card. 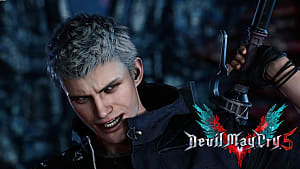 However, it allows you to play the game in new game plus mode where you can keep all your previous abilities and items. 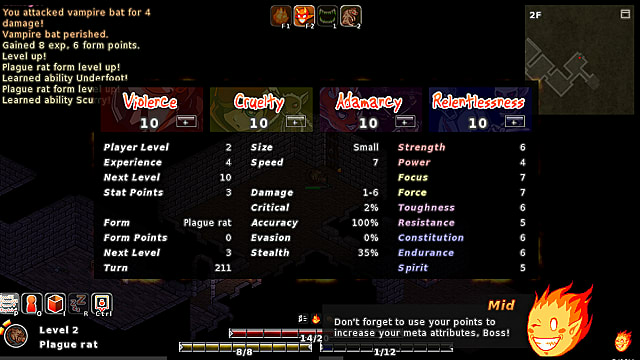 MidBoss also features a quick-play mode for those who prefer shorter play sessions with their roguelikes and a custom game mode that allows them to play the game the way they want to. 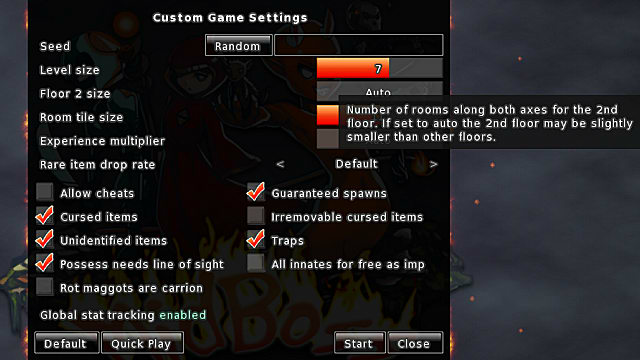 In the custom game mode, players can adjust level size, tile size, the experience multiplier, how often rare items drop, whether cheats are allowed, and whether all innate abilities are already available for imp form. 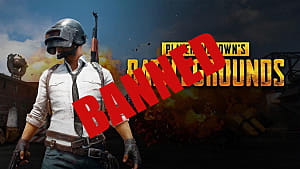 This mode is perfect for players who want to experiment with the difficulty of the game, or those who just want to learn more about the mechanics. The art style of the characters was created by Emma Maassen. It provides plenty of charm to the overall experience, and it's also a great art style that could be put on clothing and merchandise if the game gained enough popularity. 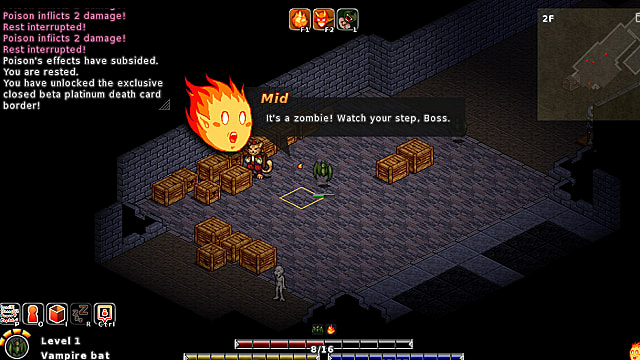 The soundtrack in MidBoss was composed by 'yuzuki' and provides the game with a rather haunted and medieval feel, which is a perfect fit for the game's generic RPG dungeon environment. MidBoss also features 12 retro mode filters that change the appearance of the game screen for those who long for the games of the past, such as a Game Boy and a Pen & Paper filter, among others. While MidBoss is a decent game with plenty to offer, its movement speed is its biggest weakness. 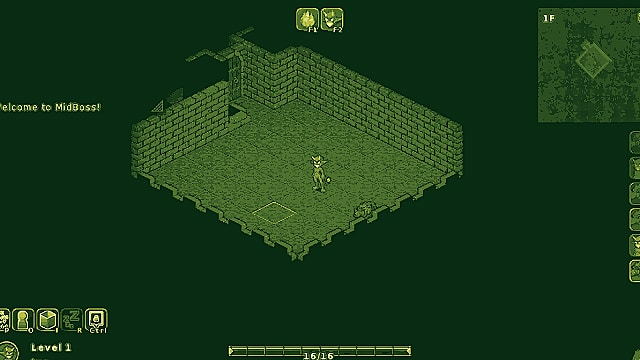 The grid based movement works fine for battles, but it's terrible for traversing through the dungeon. You can only move tile by tile with the use of either the mouse or the keyboard. 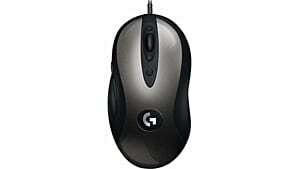 Using the mouse, movement can go a bit faster, but there's plenty of excessive clicking, which can get annoying. Using the keyboard isn't much better. The controls won't always get you where you want to go -- if they do, not fast enough. Of course, this movement can be slightly sped up in quick-play and custom game modes, but the awkward movement still persists. This not only makes it hard to navigate the dungeon but is also a problem when a strong enemy notices you and starts chasing you, which can lead to your death. If this aspect could be improved upon, in addition to improvements to more minor details --which is likely to happen anyway -- then MidBoss could turn out to be the great roguelike that it should be. Ultimately, MidBoss is a charming game with an amusing concept, enjoyable soundtrack, unique art style, and mostly satisfying gameplay. However, it falls short due to its slow movement speed a sometimes fickle movement controls. For those who have the patience to navigate a dungeon one tile at a time while narrowly avoiding certain enemies -- or getting killed by them after having no place to run -- this may be a great experience. 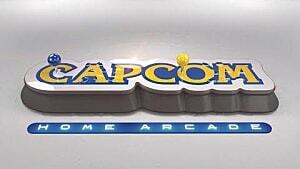 And who knows, maybe the team will make various improvements in the future. If this game interests you at all, it's at least worth a try. MidBoss is currently available on Steam for $14.99. MidBoss has a unique and well-executed concept, but a glaring flaw keeps it from reaching its full potential.